The kidneys are two organs, each about the size of a fist, located in the upper part of a person's abdomen, toward the back. 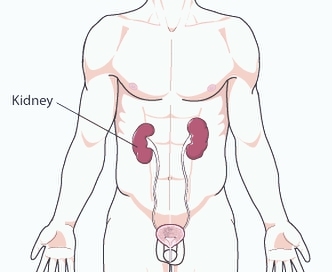 The kidneys filter waste from the blood to form urine. They also control amounts of certain vital substances in the body. Kidney disease damages your kidneys, preventing them from cleaning your blood as well as they should. This damage can cause waste to build up in your body and lead to other health problems, including heart disease and weak bones. It can cause anemia, which makes you feel tired and weak as the number of red blood cells becomes low. Chronic kidney disease can eventually cause kidney failure if not treated. If you have kidney disease, it's important to be diagnosed early. Blood and urine tests are the only ways to tell if you have chronic kidney disease. - Keep blood pressure normal and diabetes, but check with your health care provider for your appropriate target. - Stay in your target cholesterol range. - Eat foods lower in sodium. - Take your medications as directed. - Get blood and urine tests to check for kidney disease, as your doctor advises.